LG has finally revealed that its over-sized smartphone, the LG Optimus Vu, will be coming to Europe and other markets this September. 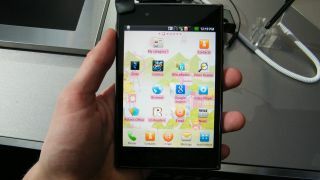 Originally announced and launched in Korea, the LG Optimus Vu is a beast of a phone, offering a 5-inch 4:3 aspect ratio display, Nvidia Tegra 3 performance and an Ice Cream Sandwich OS. TechRadar first played with the device back in February at MWC, where in our hands-ons: LG Optimus VU review we noted that while it is a direct rival to the Samsung Galaxy Note, it was unclear whether we would actually see the device come to the UK. TechRadar has contacted LG to see if it is UK bound, what we do know is that it will be coming to 'select' markets in Europe, Asia, Middle East/Africa and Latin America this September. According to LG, the Optimus Vu has proved rather popular in Korea, with the device selling over 500,000 units – despite its form factor being rather unusual. With IFA 2012 just around the corner it will be interesting to see if LG decided the Vu is worth a follow-up. It is likely we are going to see the Galaxy Note 2 at the European show, so there's definitely life in the phone/tablet hybrid space.